Carsote, M. et al. Circulating Serotonin as Bone Remodelling Marker in Women. (2015) J Gynecol Neonatal Biol 1(2): 47-49. The bone remodelling represents a physiological reparative process which is constant into the human body. The underlying aspects include osteoclasts activity (for instance areas of bone are resorbed) and osteoblasts activity that fill with new bone the resorbed zones (bone formation). Normally there is a balance between these two mechanisms. By this continuum a major contribution to the quality of bone is achieved[1,2]. The bone turnover is influenced by age: in time resorption become more pronounced that bone formation causing a net loss of bone, and thus damaging the skeleton integrity. In women a secondary factor is essential: the timing of menopause and the consecutive exposure to estrogens deficiency[2,3]. Overall the bone quality suffers by affecting the micro-architecture, decreasing the mineralisation and increasing the cortical porosity[3,4]. The process of remodelling is best assessed by bone markers levels. They are biochemical parameters with blood or urinary assay that offer to the clinician a rapid and facile clue regarding the bones turnover status (see Figure 1)[5,6]. They predict the fracture risk especially in some menopausal population but the references levels still vary so a specific pattern cannot actually be predicted[5,6]. Some persons with menopausal osteoporosis may have normal bone markers while others display a high status of bone turnover bio-markers. The data regarding the correlation to bone mineral density as assessed by central DXA (Dual Energy X-Ray Absorptiometry) are heterogeneous but usually in subjects with osteoporosis higher bone resorbtion markers are found compare to control group. Overall the biochemical markers are not recommended for the diagnosis of osteoporosis by any guideline. They may become useful in follow-up the patients who started anti-osteoporotic drugs especially if they had a high values at the beginning of therapy[5,6,7]. An extended usefulness is seen in clinical trials in order to express the medication effects. However the routine use in not recommended and the intra-individual variations are difficult to “translate” in everyday practice[5,6,7]. Despite the fact that bone remodelling is a very complex process that makes necessary a large panel of different neuromodulators, hormones, neuromediators, and circulating molecules of bone origin their clinical significance is reduced. Among them serotonin or 5-Hydroxytryptamin (5-HT) plays an interesting role and yet incompletely known up to this moment. Serotonin is generally known as connected to several disorders as anxiety, depression, autism, anorexia nervosa, gastro-intestinal maladies, neuroendocrine tumours, and potentially osteoporosis (but many issues are still a matter of debate)[8-11]. The molecule is named from the fact that is assayed in the serum and influence the vascular tone. It is synthesized starting from the essential amino acid tryptophan. The main enzyme is tryptophan hydroxylase: type 1 (Tph) is used in periphery while type 2 is seen exclusively in brain[8-11]. The monoaminehas a specific class of 5-HT receptors (seven types) and plasma membrane transporters (5-HTT or SERT) that are interfered by drugs as SSRI (Selective Serotonine Re-uptake Inhibitors)[8-11]. Circulating 5-hydroxytryptamin represents the majority (95%) of body serotonin and it is produced by the enterochromaffin cells of the gut mainly with a paracrine function (influencing the peristalsis and the mucus secretion). 95% of intestinal serotonin is taken by platelets and stored in dense granules (but the plates cannot synthesize serotonin). From platelets 5-HT is released in order to serve the platelets aggregation and blood clotting (haemostasis). However 5% of the circulating form is free in plasma and its role is unknown[8-11]. Based on these practical points in circulating serotonin pathways the current assay depends on the moment and type of blood withdrawn. Normally the central serotonin is not tested into the blood. Extremely high circulating levels are seen in carcinoid tumours together with other neuroendocrine markers as chromogranin A or neuron specific enolase (blood markers) or 5-hydroxy indol acetic acid (24-hours urinary test). The brain serotonin usually serves as a neurotransmitter of feeding and satiety, energy control, and cognitive functions by using the activation of different 5-HT receptors subtypes[8-11]. Serotonin and its bone effects are best described by the expression “two faces molecule” since 5-HT is a unique molecule in the human body with dual (opposite) effects between central and circulating monoamine despite identical biochemical structure. 5-HT does not cross brain-blood barrier and the levels from brain or blood are not connected by a feedback loop or by common control[8-11]. The central indirect effect is pro-bone mass and the peripheral 5-HT directly acts on bone by decreasing the bone formation (see Figure 2). This particular type of skeleton influence may induce the idea that circulating serotonin serves as a bone remodeling marker. Serotonin’s important role in skeleton metabolism is sustained by the observation that all the bone cells display 5-HT receptors but their specific role is incompletely known[8-11]. A part from great variety of results to the different serotonin tests or kits the correlations between circulating 5-HT and classical bone biomarkers or even between 5-HT and bone mineral density offers very diverse data according to many studies and the reasons of these heterogeneous results are only partially understood. It is important to highlight that (as seen in common bone turnover markers) intra-normal variations of circulating serotonin are usually displayed in common populations regardless the presence of osteoporosis. A study published in 2010 on 275 women (90 subjects in pre-menopause; 125 subjects in post-menopause without hormonal replacement therapy or HRT and 60 women on HRT) found that circulating serotonin is statistically significant inversely correlated with BMI (Body Mass Index) of r = - 0.23 (p < 0.001); to the total body a BMD (Bone Mineral Density provided by central DXA) and spine a BMD (a week correlation of r = -0.16, respective r = -0.17), to femoral neck vBMD (r = - 0.25, p < 0.001), to trabecular thickness of the radius (r = -0.14, p < 0.05). The similar correlations are seen in multivariable models (with age and BMI adjustment). Circulating 5-HT is higher in pre-menopause that after menopause and its levels are correlated to bone resorption markers only in pre-menopausal women not in post-menopausal subjects (for P1NP: r = 0.21, p < 0.05; for CTX: r = 0.29, p < 0.01). In 2013 a study on 191 menopausal Caucasian women without previous specific therapy for osteoporosis analysed the correlations between circulating serotonin and blood bone formation markers osteocalcin and alkaline phosphates and bone resorption marker circulation CrossLaps. Three groups of patients were formed based on central DXA results (normal DXA, osteopenia and osteoporosis). No correlation between circulating 5-HT and any of the markers, neither lumbar BMD (as assessed by central DXA) was found (including after adjustment for age and BMI) except for a positive low correlation between serotonin and alkaline phosphates in osteopenia group (N = 88 subjects, r = 0.24, p = 0.03). In 2015 the same researchers extended the sample population to 202 subjects and proved that peripheral serotonin is higher in the sub-group with low BMD (110 subjects with osteoporosis and osteopenia) compare to women with normal DXA (187.07 vs. 163 ng/mL, p < 0.05) while the others mentioned bone turnover markers were not statistically significant between the two groups. In 2014 another study on 480 women and men (235 young women, 121 pre-menopausal females and 124 postmenopausal females, and 168 men) confirmed the declining values of circulating serotonin according to an age-dependent pattern and its negative correlation to BMI (r = -0.39, p < 0.001) in women. The correlation to bone traits was not useful in men opposite to women who had levels positively correlated to whole body a BMD (in menopause: r = 0.34, p < 0.001), total femur aB-MD-DXA (r = 0.4, p < 0.001), and lumbar aBMD (r = 0.22, p < 0.01, after weight adjustment) and similar data were found for vBMD (volumetric BMD) at distal radius. A positive correlation was also found between serum osteocalcin and circulating serotonin in all women (r = 0.28, p < 0.001); however the statistical significance found in young women (r = 0.18, p < 0.01) was lost in pre-menopause and post-menopause group. Serotonin exerts a unique human behavior: the same biochemical structure display opposite bone effects if it is located in brain or peripheral. If circulating serotonin will serve as a bone remodeling biomarker still represents a cutting edge with many unanswered questions and further clinical studied are necessary to bring more practical points in this dynamic and complex field of skeletal neuroendocrinology especially in women. 1. Garnero, P., Delmas, P.D. 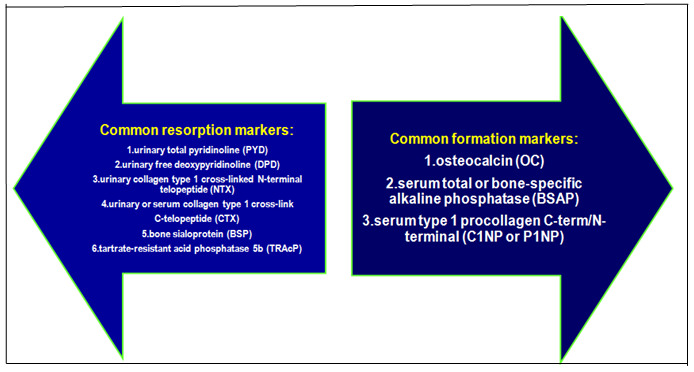 Biochemical markers of bone turnover : clinical usefulness in osteoporosis. (1999) Ann Biol Clin (Paris) 57(2): 137- 148. 2. Eastell, R., Hannon, R.A. Biomarkers of bone health and osteoporosis risk. (2008) Proc Nutr Soc 67(2): 157- 162. 3. Nomura, Y., Yoshizaki, A., Yoshikata, H., et al. Study of the distribution by age group of serum cross-linked C-terminal telopeptide of type I collagen and procollagen type I N-propeptide in healthy Japanese women to establish reference values. (2013) J Bone Miner Metab 31(6): 644- 651. 4. Eastell, R., Hannon, R.A. Biomarkers of bone health and osteoporosis risk. (2008) Proc Nutr Soc 67(2): 157- 162. 5. Tamaki, J., Iki, M., Kadowaki, E., et al. Biochemical markers for bone turnover predict risk of vertebral fractures in postmenopausal women over 10 years: the Japanese Population-based Osteoporosis (JPOS) Cohort Study. (2013) Osteoporos Int 24(3): 887- 897. 6. Garnero, P. Biomarkers for osteoporosis management: utility in diagnosis, fracture risk prediction and therapy monitoring. (2008) Mol Diagn Ther 12(3): 157- 170. 7. Kucukalic-Selimovic, E., Valjevac, A., Hadzovic-Dzuvo, A. The utility of procollagen type 1 N-terminal propeptide for the bone status assessement in postmneopausal women. (2013) Bosn J Basic Med Sci 13(4): 259- 265. 8. Lam, D.D., Garfield, A.S., Marston, O.J., et al. Brain serotonin system in the coordination of food intake and body weight. (2010) Pharmacology, Biochemistry and Behaviour 97(1): 84- 91. 9. Haney, E.M., Calarge, C., Bliziotes, M.M. Clinical Implications of Serotonin Regulation of Bone Mass. (2013) Translational Endocrinology of Bone 16: 189- 197. 10. Ducy, P. 5-HT and bone biology. (2011) Curr Opin Pharmacol 11(1): 34- 38. 11. Fu, H.J., Zhou, Y.R., Bao, B.H., et al. Tryptophan hydroxylase 1 (Tph-1)-targeted bone anabolic agents for osteoporosis. (2014) J Med Chem 57(11): 4692- 4709. 12. Modder, U.I., Achenbach, S.J., Amin, S., et al. Relation of Serum Serotonin Levels to Bone Density and Structual Parameters in Women. (2010) JBMR 25(2): 415- 422. 13. Carsote, M., Radoi, V., Geleriu, A., et al. 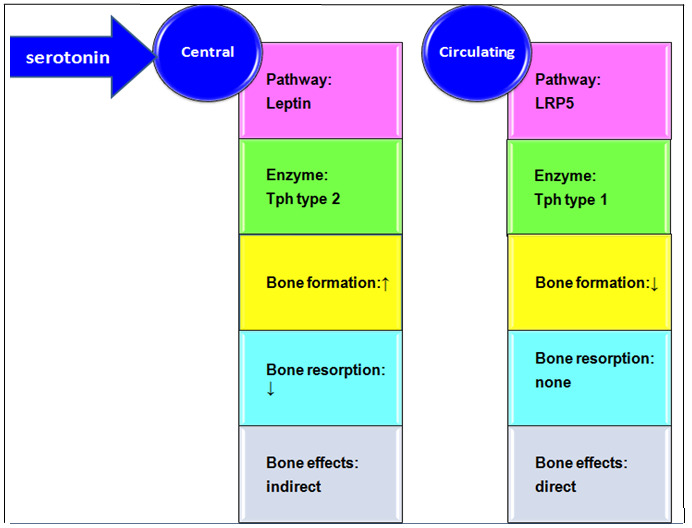 The serotonin and the bone assessment. (2013) J Med Life 6(2): 151- 155. 14. Carsote, M., Capatina, C., Caragheorgheopol, A., et al. The use of serotonin assay in menopausal women skeleton evaluation (with or without osteoporosis). (2015) The 49 Annual Scientific Meeting ESCI Medimond Procedding 99- 102.